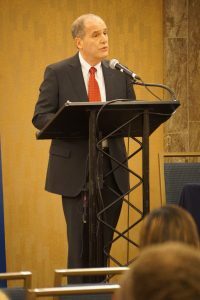 When I became AALS President during the first week of January at our Annual Meeting in San Francisco, I spoke of the need to ensure access to justice in the U.S. and the role law schools can and do play in that effort. I knew then about many wonderful programs offered by our member schools, and I mentioned a number of them by name. I also knew then about remarkable collective efforts being put forth across the nation: as the recent AALS survey made clear, more than $50 million worth of pro bono legal service was provided in 2016, with thousands of law students participating in a wide variety of projects and volunteering millions of hours to support the public good. Little did I know then, however, that we would soon be put to an extreme test. Thousands of individuals were affected by the executive order issued in late January restricting travel to the U.S. from seven predominantly Muslim nations. Lawyers and students responded in record time to assist those who were struggling to receive vital legal aid and much-needed information. Tremendous efforts by lawyers, law students, and law teachers resulted in something we rarely encounter: genuine gratitude for the work of our profession. Signs were seen and chants were heard at airports throughout the country: “Let the lawyers in,” “let them see their lawyers,” “thank you, lawyers.” Lawyers, yes—and law students and faculty members, as well. The actions of people in the legal education community were nothing short of extraordinary. Let me outline for you just a few of the many we saw develop in a very short period of time. Schools immediately organized programs to educate people on the reach of the executive order and its impact on them. Close to 200 UCLA law students joined with lawyers and immigration advocates to spread information about the order in Southern California. Immigration law forum programs at Western New England University, Arizona State University, and Washington University laid out the manner in which communities in those parts of the nation might be impacted by the new travel and immigration restrictions. At American University, the law school had a “rapid response teach-in” where faculty members explained the effects of the ban and discussed potential legal challenges. Students from the University of California at Davis communicated with family members in the U.S. who in turn contacted loved ones who were caught up in the limitations. From the University of Colorado to Catholic University, numerous schools had faculty and students go immediately to international airports to explain the executive order and offer aid. Washburn University students and faculty created a community education project with the Topeka Public Schools to respond to the fear and uncertainty created by the executive order. Other law schools moved rapidly to engage in litigation challenging the executive order. At Brigham Young and the University of Utah, law professors joined a court brief in the U.S. Court of Appeals for the 9th Circuit. Students and professors from Harvard filed papers opposing the government’s motion to stay a temporary restraining order issued by the U.S. District Court for the Western District of Washington. Yale students and faculty were successful in persuading a federal judge in Brooklyn to issue a nationwide temporary stay blocking the government from deporting people pursuant to the executive order. Legal clinics at NYU, the University of Iowa, Albany, and the George Washington University were among the large number of law schools that offered legal advice to individuals regarding their status and the options open to them under the executive order. To our public-spirited faculty colleagues and our students, for all that you do for the public good and especially for what you did in response to serious concerns of due process and discrimination, I thank you. You have made us all proud.